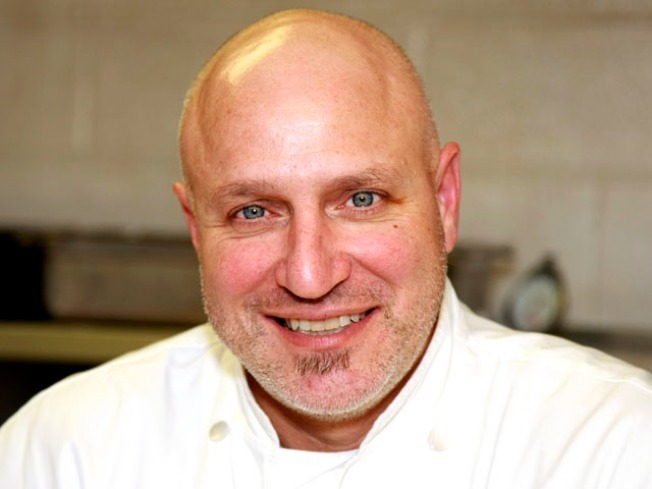 Top Chef judge Tom Colicchio talks shop at 92nd Street Y. Who knew watching chefs could be so entertaining? “Top Chef” enters its seventh season on June 16 with 17 new chefs competing for the title on the show People magazine called “the model for cook-off competitions.” It’s high praise considering the sheer number of competition cooking contests crowding the tube these days. All sorts of food-centric shows have been on the rise for the past few years, and the latest proof of their popularity is the launch of the new Cooking Channel network — a cable spin-off of The Food Network — on May 31. Not that cooking shows haven’t been around since the early days of TV, when local cooking programs provided cheap content. Programmers wanted daytime series that appealed to housewives charged with delivering family meals three times a day. Later, Julia Child (“The French Chef”), Graham Kerr (“The Galloping Gourmet”), Jeff Smith (“The Frugal Gourmet”), Jacques Pepin (“The Complete Pepin”) and Martin Yan (“Yan Can Cook”) all proved chefs had a personality to sell in addition to their culinary skills. But when the Japanese cooking game show “Iron Chef” popped up more than a decade ago, doors flew open for the wide variety of cooking competitions, including the spin-off “Iron Chef America,” not to mention “Top Chef,” “Chopped,” “Hell’s Kitchen” and new summer series “MasterChef” on Fox. And the new Food Network show “Cupcake Wars” and Bravo’s upcoming “Top Chef: Just Desserts” prove even sweets can lead to bitter battles. Cooking-competition series blend two things Americans are most passionate about: food and sports. It’s the thrill of the chase as chefs battle it out to see who can do the best job under the pressure cooker. For the foodie, watching the skill it takes to complete these tasks is incentive enough to watch. For the non-foodie, just seeing professionals falling apart — or rising above — provides plenty of entertainment value. Watching chefs sweat into their food and put a licked spoon back into the pot, or learning some chefs can’t taste the difference between a carrot and a parsnip might be enough to actually turn people away from restaurants. Yet knowing these accomplished cooks will get their comeuppance is almost worth the pain. Like with a NASCAR race, you always know some crash is right around the corner. And there's always some comfort for everyone in knowing even professionals can have a failed dish ... or six. While most shows follow the same formula of testing the chefs’ ability under intense conditions, every show has a different gimmick. On “Chopped,” even the most casual cook can pick up a tip or two when the contestants are given bare-bones ingredients in a mystery box and told to whip up something delish in just 30 minutes. Three courses, three eliminations, winner announced. Move on to the next batch. “Cupcake Wars” offer the same fast-moving elimination rounds, but the food-making process gets short coverage in favor of more competition drama with the high-strung dessert divas. Come for the recipes, but stay for the drama. Cohen said even a show like “Top Chef” doesn’t aim just for the food-lover audience. The shows are cast to stir the pot with a variety of volatile personalities. While “Top Chef” likes to keep the drama at a constant simmer, “Hell’s Kitchen” turns up the heat with combustible host Gordon Ramsay. Weed said the high ratings of “Hell’s Kitchen” prove that they are drawing in more than just foodies. He chalks that up to the personalities of the chefs. Some may call them passionate, others may call them crazy. But from any vantage point, viewers have come to realize that chefs are an eclectic bunch of free spirits who have a definite point of view. Most chefs are opinionated and not afraid of crossing lines when it comes to standing up for their artistic vision. On a recent episode of “Hell’s Kitchen,” one chef turned in his jacket because he was tired of the constant criticism dished out by Ramsay. When he was told that many people would love to be in his shoes, he stepped out of his footwear and offered them to anyone who wanted to take a stroll into Ramsay’s version of Hades. Cooking shows may be bursting with tips as well as personalities, but at least one producer has walked away with a solid message after working on cooking shows for years. So much better to just watch the drama unfold on television.